Business, work, family, distance - has your busy lifestyle been causing you to postpone your renovations? Wait no longer - Custom Kitchens Noosa can offer you a project management service that will get the job done with no extra stress or time taken from your hectic schedule. Our experienced project managers will oversee your entire renovation from start to finish, ordering materials and appliances, as well as scheduling and managing all tradesmen and suppliers within your budget. We take on the responsibility of planning, organising, controlling and coordinating all the trades on all aspects of a project, including painting and decorating, services trades and any additional building and/or renovation works etc. The Custom Kitchens project management service is also ideal for people who live interstate, with holiday or investment properties here on the Sunshine Coast. 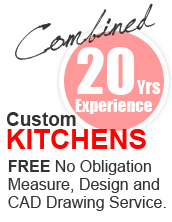 At Custom Kitchens Noosa we pride ourselves on our attention to detail so you have peace of mind that your renovation will be completed to the highest standards with a minimum of disruption. Call us today on 07 5473 9555 EXCITING NEW SHOWROOM COMING SOON! Lynden renovated our kitchen, bathroom and did some structural work to create a walk-in wardrobe late last year. Lynden co-ordinated all the work and tradesmen, he in effect became the project manager, which was a load off my mind, he did all this without loading the quote or charging excessively. All the work carried out is top quality. The bathroom tiling is a masterpiece, everything lines up perfectly. I have never renovated before so I had no idea of cost, some of my friends who know a thing or two about renovating say we got an excellent price for the work done. I am happy to recommend Lynden and his team to anybody, he delivered on time, on budget.